Most flowers rely on animal pollinators for the transfer of their genes. As a result, flowers have developed different strategies to attract and reward pollinators, including variable shapes, specific scent, colour, and nectar production. Petals are the main visual attractant for floral visitors and have evolved repeatedly in the angiosperms (Ronse De Craene and Brockington 2013). Petals can be generally distinguished from sepals by their bright colour, but also by the development of a specific cell type. These cells, called papillate conical cells, are generally concentrated mainly on the ventral side of the petal. Conical cells have been considered as a distinctive trait for petals that are found in the majority of angiosperms and several authors consider the conical cells as a defining marker for petal identity (Irish 2009). 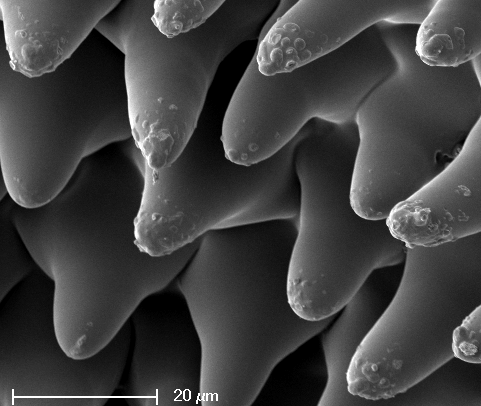 SEM image of the ventral petal surface of Solanum sp. (Solanaceae) showing the conical epidermal cells. Courtesy of B. Glovers. As such they are used as evidence for explaining homeotic conversions between petals and other organs. The petal epidermal micromorphology is increasingly investigated as a marker of petal identity (e.g. Logacheva et al. 2008, Ojeda et al. 2009, Landis et al. 2012). The genetic basis for conical cells is complex. Conical cells in Antirrhinum and Petunia are regulated by MIXTA and MIXTA-like genes (Noda et al. 1994, Baumann et al. 2007), which have also been linked to hair formation. In petals, MIXTA is expressed when the cells do not divide, and so they differentiate as conical cells. However, in leaves of transgenic plants ectopically expressing MIXTA the cells divide and produce trichomes (Glower et al. 1988). In the bilaterally symmetric flowers of Lotus japonicus (Leguminosae), homologues of CYCLOIDEA are responsible for the differentiation of the dorsal petal and the activation of MIXTA genes linked with the development of papillate conical cells (Feng et al. 2006, Wang et al. 2010). However, in Arabidopsis it is not known which genes are responsible for the conical cell formation (Glover and Martin 2002). In a recent review Whitney et al. (2011) explained that conical cells are important in changing the optical properties of the petals, as well as their wettability, temperature and the production of scent. The most important attributes, however, are optical and mechanical, in advertising the flower and in providing a foothold for visitors (Kay et al. 1981, Whitney et al. 2009, Alcorn et al. 2012). Bees are known to grasp the petals, especially in vertical bilaterally symmetrical flowers, and this is the main function of the conical cells, next to light absorption. Birds, on the other hand, do not need a foothold, as they can hover in front of the flower (the case of hummingbirds), or visit the flower from a neighbouring perch (most honeycreepers and sunbirds) (Proctor et al. 1996). Thomson and Wilson (2008) reviewed the mechanisms leading to a shift between bee and hummingbird pollination in closely related species, such as Mimulus and Penstemon. However, they did not consider the presence or absence of conical cells. Attributes of bird pollination are different, and one could be the absence of conical cells. Indeed, Ojeda et al. (2012) investigated the presence of conical cells on petals of Macaronesian Lotus (Leguminosae), using established knowledge of the phylogenetic relationships in the genus. They demonstrated that conical cells are lost when flowers shift from bee pollination to bird pollination. While most bee-pollinated Lotus species are characterized by abundant conical cells, especially on the standard petal and to a lesser extent on the wings, bird-pollinated species, such as L. berthelotii have the papillate cells replaced by tabular rugose cells. The authors also found a higher concentration of trichomes on the standard and wing petals and suggested that a shift to bird pollination was accompanied by a shift in petal identity. The known gene expression in Lotus japonicus shows the requirement of LjCYC2 for standard petal development and the differentiation of conical cells, while LjCYC3 appears to regulate the development of wings and tabular rugose cells (Feng et al 2006. 2006, Weng et al. 2011). In bird pollinated Lotus LjCYC3 would have a more expanded expression at the expense of LjCYC2. The driving force in this change must be the pollinator preferences. The example of Lotus shows the flexibility of flowers to adapt to different pollinators. The transition functions as a means to exclude one kind of visitor to the advantage of another. That conical cells have a major function as providing a foothold for visitors comes from observations in other groups of plants. It is not only the bird pollination syndrome that leads to a loss of conical cells. Case studies in Solanaceae have shown that conical cells are variously present in the genera Solanum and Nicotiana (Glover pers. comm.). An important factor for loss of conical cells besides bird pollination could be a shift to buzz-pollination. The mechanism of buzz-pollination implies that pollen is released from the anthers by the vibration of wings of visiting insects. In buzz-pollinated flowers petals are usually reflexed and visitors either hover below the flower or grasp the anthers to shake out the pollen (Proctor et al. 1996). In a broader study of Leguminosae, Ojeda et al. (2009) also found that conical cells are not distributed evenly among different subfamilies. While Faboideae generally have conical cells, these are not always present in Caesalpinoids, and are generally absent in Mimosoids. Flowers of Mimosoids have their flowers grouped in heads and the main attractant are long showy stamens (so-called brush flowers: Ronse De Craene 2010). As a result the smaller petals lack the conical papillate cells. These observations indicate that conical cells are very specifically correlated with specific pollination systems as suggested by Kay et al. (1981) and that shifts in pollinators could lead to their disappearance. 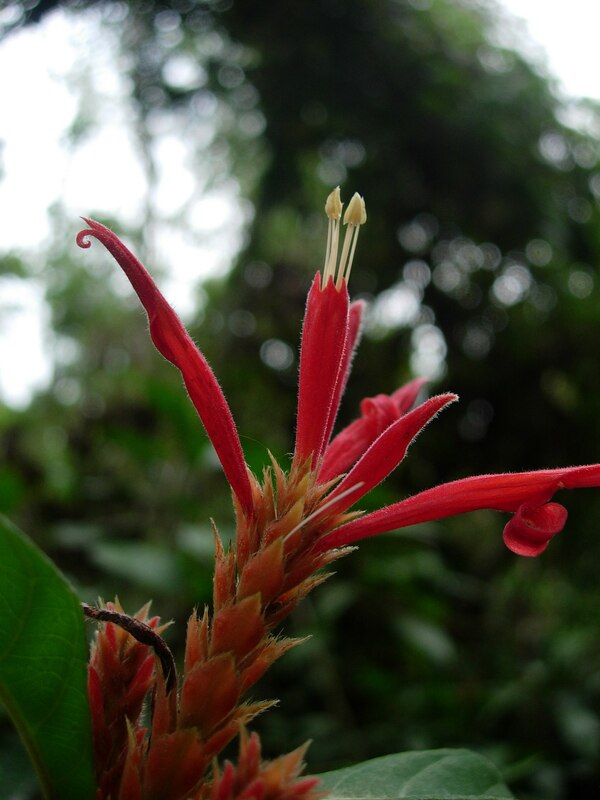 A current project at RBGE is investigating the evolution of conical cells in the Gesneriaceae, a large mainly tropical family that has evolved different modes of pollination. The understanding of the phylogeny of this large family (e.g. Möller et al. 2009) and known pollination mechanisms (e.g. Harisson et al. 1999) is important to postulate evolutionary changes and the drivers for change in the floral morphology. Flowers have a tremendous ability to adapt to changes in requirements from visitors and – in a striking analogy with the human world – are truly experts in changing the accommodation and shifting the menu on offer to full satisfaction of the customer. Alcorn, K., Whitney, H. and B.J. Glover. 2012. Flower movement increases pollinator preference for flowers with better grip. Functional Ecology 26: 941-947. Bauman, K., Perez-Rodriguez, M., Bradley, D., Venail, J., Bailey, P., Hailing, J. et al. 2007. Control of cell and petal morphogenesis by R2R3 MYB transcription factors. Development 134: 1691-1701. Feng, X., Zhao, Z., Tian, Z., Xu, S., Luo, Y., Ca, Z., Wang, Y. et al. 2006. Control of petal shape and flower zygomorphy in Lotus japonicus. Proceedings of the National Academy of Science USA 103: 4970-4975. Glover, B.J., and C. Martin. 2002. Evolution of adaptive petal cell morphology. In Q.C.B. Cronk, R.M. Bateman, and J.A. Hawkins, eds., Developmental Genetics and Plant Evolution. Taylor & Francis, London, 160-172. Glover, B.J., Perez-Rodriguez, M., and C. Martin. 1998. Development of several epidermal cell types can be specified by the same MYB-related plant transcription factor. Development 125: 3497-3508. Harrison, C.J., Möller, M., and Q.C.B. Cronk. 1999. 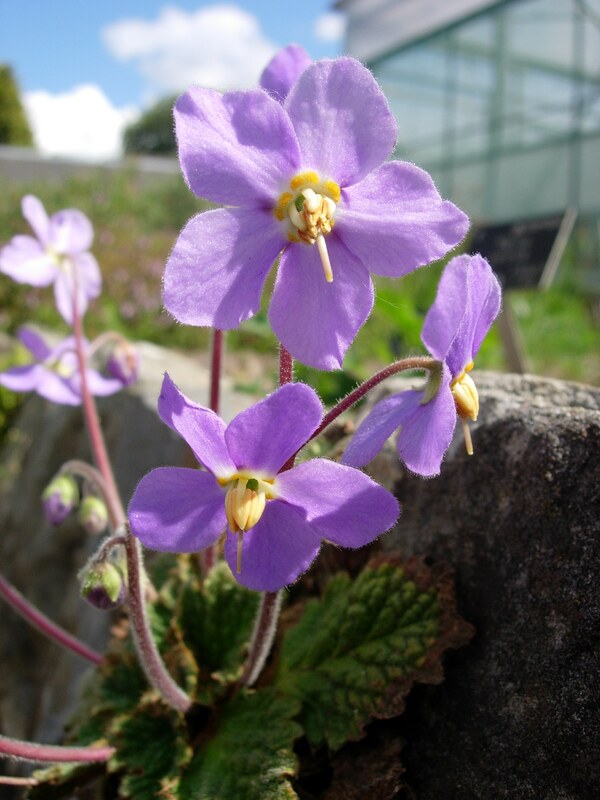 Evolution and development of floral diversity in Streptocarpus and Saintpaulia. Annals of Botany 84: 49-60. Irish, V. 2009. Evolution of petal indentity. Journal of Experimental Botany 60: 2517-2527. Kay, Q.O.N., Daoud, H.S., and C.H. Stirton. 1981. Pigment distribution, light reflection and cell structure in petals. Botanical Journal of the Linnean Society 83: 57-84. Landis, J.B., Barnett, L.L., and L.C. Hileman. 2012. Evolution of petaloid sepals independent of shifts in B-class MADS box gene expression. Development Genes and Evolution 222: 19-28. Logacheva, M.D., Fesenko, I.V., Fesenko A.N., and A.A. Penin. 2008. Genetic and morphological analysis of floral homeotic mutants tepal-like bract and fagopyrum apetala of Fagopyrum esculentum. Botany 86: 367-375. Möller, M., et al. 2009. A preliminary phylogeny of the ‘Didymocarpoid Gesneriaceae’ based on three molecular datasets: incongruence with available tribal classifications. American Journal of Botany 96: 989-1010. Noda, K.I., Glover, B.J., Linstead, P., and C. Martin. 1994. Flower colour intensity depends on specialized cell shape controlled by a Myb-related transcription factor. Nature 369: 661-664. Ojeda, I. Santos-Guerra, A., Caujapé-Castells, J., Jaén-Molina, R., Marrero, A., and Q.C.B. Cronk. 2012. Comparative micromorphology of petals in macaronesian Lotus (Leguminosae) reveals a loss of papillose conical cells during the evolution of bird pollination. International Journal of Plant Sciences 173: 365-374. Proctor, M., Yeo, P., and A. Lack. 1996. The Natural History of pollination. Timber Press, Portland, Oregon. Ronse De Craene, L.P. 2010. Floral diagrams. An aid to understanding flower morphology and evolution. Cambridge, Cambridge University Press. Ronse De Craene, L.P., and S. Brockington. 2013. Origin and evolution of petals in the angiosperms. Plant Ecology and Evolution 146: in press. Thomson, J.D., and P. Wilson. 2008. Explaining evolutionary shifts between bee and hummingbird pollination: convergence, divergence, and directionality. International Journal of Plant science 169: 23-38. Wang, J. Wang, Y., and D. Luo. 2010. LjCYC gees constitnte floral dorsoventral asymmetry in Lotus japonicus. Journal of Integrative Plant Biology 52: 959-970. Weng, L., Tian, Z., Feng, X., Li, X., Xu, S., Hu, X., Luo, D., and J. Yang. 2011. Petal development in Lotus japonicus. Journal of Integrative Plant Biology 53: 770-782. Whitney, H., Chittka, L. Bruce, T., and B.J. Glover. 2009. Conical epidermal cells allow bees to grip flowers and increase foraging efficiency. Current Biology 19: 948-953. Whitney, H.M., Bennett, K.M.V., Dorling, M., Sandbach, L., Prince, D., Chittka, L., and B.J. Glover. 2011. Why do so many petals have conical epidermal cells? Annals of Botany 10: 609-616. Thanks to Beverley Glover for helpful suggestions to improve the text. This entry was posted in Uncategorized and tagged bird pollination, buzz pollination, conical cells, evolution, flowers. Bookmark the permalink.